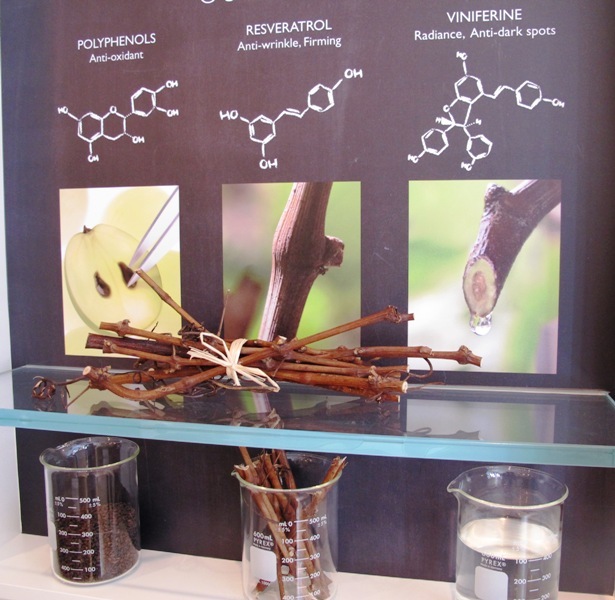 Caudalie is a beautiful French brand with the grape and its effectiveness ( resveratol, polyphenols, viniferine ) at its core. It was created by Mathilde Thomas who believes in beauty products not only being effective but also natural and luxurious. Following her meeting with Professor Vercauteren during the 1993 grape harvest in the vineyards of Chateau Smith Haut Lafitte, Caudalie was born and now the brand is properly spreading its wings and winning praise for efficacy of its treatments and products around the world. I first visited Caudalie hotel and Spa quite a few years ago, when it was more of a French inner secret and to this day I have the most serene memories of each time spent there, luxuriating in the sunshine, enjoying bird song, walking along the vines, eating delicious food & drinking delicious tisane in the Spa, where the treatments range from beautiful facials to effective solutions for your body and the most pampering pregnancy massage imaginable. Now you don’t have to travel to Bordeaux if you want to learn about Caudalie, just pop into its beautiful store and Spa right in the heart of Covent Garden in Monmouth street. With beautiful vines framing the windows, wine crates acting as the drawers for products and samples, a beautiful counter located in the middle of the store, where you can experience the magic on 15 minute mini facials, and extensive product displays, as well as the treatment room downstairs, what more can one ask for ? There are products for every need of face and body, miniature products for your handbag or travels, expert advice from the lovely staff, delicious draining Caudalie tea or even some wine, if you are lucky. The shop is light and airy and has the wonderful feel of the Caudalie in Bordeaux, with a display of best-sellers and the opportunity to smell and try everything. Downstairs you can try five types of facials ( Express D-Vine, Premier Cru,Vinoperfect radiance, Vineexpert Firming or Vinosource Hydrating facial ), as well as three types of body massage ( Divine Body, Crushed Cabernet or Fleur de Vigne ). The room downstairs isn’t just soothing in its charm, it even has the wallpaper that was created especially for it, paying homage to tradition of Caudalie wines & beauty potential of grapes in Bordeaux. The grapevine remains the inexhaustible resource for new Caudalie product launches ( keep an eye on four new products launching in April ) and I loved every minute of the store’s tour given to me by store manager Axel. But apart from talking all things Caudalie, my very own Caudalie creative experience came to life when Axel made me my own body scrub ( you can have it done for you in-store as well). The process starts with you smelling the oils and choosing which ones you would want to mix into your scrub ( with the Grapeseed oil being the base oil, you can add geranium, lemongrass, gin, rosemary, cypress or lemon ones-based on the effect you want for the skin, as well as your own smell preference ). After that you choose from grape pips, brown sugar or honey ( or all of them ) to get rid of the dull skin and say hello to beautifully scented, even skin. With all the ingredients chosen by me, Axel mixed them up in a glass pot, right before my eyes et voila, a fragrant and effective delight for my skin was ready, baring my name at the top of the jar. The end result is a glorious concussion that you want to eat, rather than slather your body with, but I urge you to do the latter and enjoy the full age-proofing benefit of the ingredients and your revitalised senses.